This digital package includes four magazine issues that each contain a feature article focused on math. Math, it's the universal language. For centuries, mathematicians have been immersing themselves in the mysterious world of numbers. 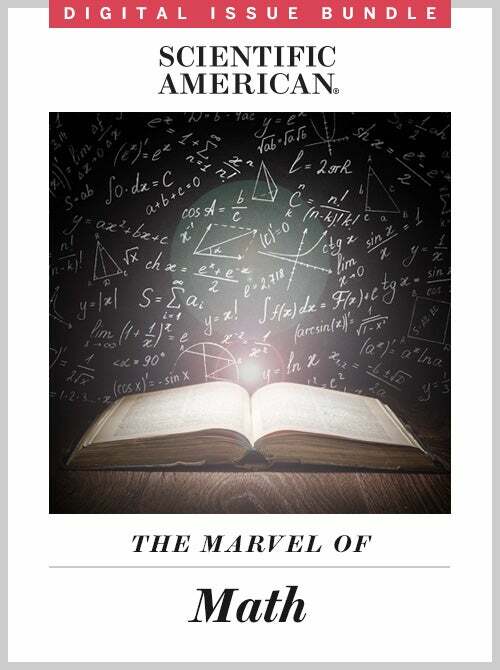 In this special digital package, we have pulled together the latest Scientific American features about all things math—the most exciting narratives, characters and research. The long-running effort to ditch the decaying 19th century artifact that defines the kilogram nears its conclusion. Before they die, aging mathematicians are racing to save the Enormous Theorem's proof, all 15,000 pages of it, which divides existence four ways. In what would be his centennial year, Martin Gardner, the longtime author of Scientific American's celebrated Mathematical Games column, still inspires mathematicians and puzzle lovers. Integral calculus originated in a 17th century debate that was as religious as it was scientific.